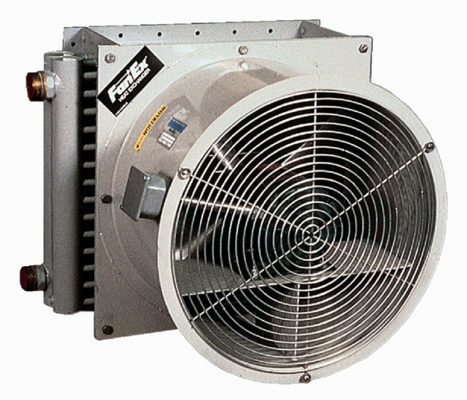 FanEx (Air/Water) Heat Exchangers units feature electric motor driven fans constructed with quality TEFC Motors. Fans are attached to the plate fin cooling core. Eight sizes with liquid flows from 40 GPM to 112 GPM Max. Materials: Aluminum Plate fins. 1/2″ OD Seamless Copper Tubes, Copper Headers, Galvaneal Steel Core Housing, Steel Motor Supports. Other materials, such as carbon steel or stainless steel, are available upon request. Electric Motor Data: All motors are totally enclosed 230/460 volt, three phase, 60 Hz as standard. Other types of motors available upon request. Applications: For cooling water or Ethylene Glycol when a liquid cooling source is not available or too expensive. Good cooling source if cooling water is not available. Heavy duty construction for long operating life. Variety of materials available for handling different fluids.